I finally threw in the towel on trying to sleep around 3 a.m. this morning. For some reason, it’s just one of those nights when it’s not going to happen. No-sleep nights don’t happen that often, but when they do, I really don’t mind it after I eventually give in and get out of bed. Actually, I find it rather peaceful to be awake when most of the world around me is asleep. Then 4 a.m. hits and I get this automatic, tiny wave of excitement, followed quickly by another wave of sadness. Growing up, if I couldn’t sleep, I knew one person on the planet who was also up at 4 a.m. – Nunny. My sweet grandmother woke up at 4 a.m. every morning to start her day, and if it happened to be a ‘once-in-a-blue-moon-Jordan-can’t-sleep’ sort of a night, I called her…right at 4 a.m. As you can see, as the only child for 12 years, I was automatically very thoughtful of others. I’m laughing thinking of how much she just must have LOVED having her granddaughter interrupt her only alone time of the day – just seconds after she opened her eyes. Then again, I know she actually did love it. I have no idea how much I threw off her days back then when I called, but I’m very sure I did. Not once do I remember her telling me she had to get off to read the paper or fold the laundry. Every time, she just chatted with me. Most of the time until 6 a.m. or so. Those mornings came rarely, but they were the most special – I think to both of us. To this day, my Nunny is the most gentle, loving person I’ve known. And what blows my mind is that I got to call her mine. From the time I was a little girl baking barefoot with her in the kitchen, to the time I was in my early twenties, venting all my boy frustrations to her, she was there. 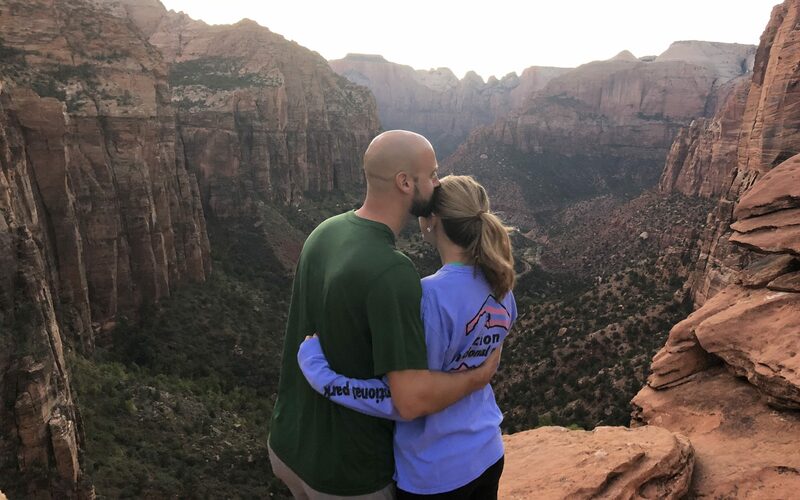 I faced hard things over the years, but she walked with me every step – sometimes it was as small as a breakdown after a bad game, or as big as the couple years of depression I faced in college. She always had an open ear, eyes full of empathy and a presence of peace. She was just one of those people that knew how to sit in things with you. Do you know one of those? She didn’t try to fix anything – she was just present. And by being present, she was more of the solution than any words could have ever been. It’s now six years since her passing, and at 4 a.m. when I can’t sleep, I really wish I could call her. I wish I could ramble my anxieties about mixing wood tones in the room we are finally decorating. I wish I could tell her how funny it was it watch our puppy try to go to the bathroom in the yard covered with snow taller than her body the other day. I wish I could ask her to re-tell a story from my mom’s childhood and hear her laugh as she thinks of her love for my momma and uncles. I wish I could hear her let me know she’ll have Boppy run some obnoxious errand for me that no other grandpa would or should do for their grandchild – of course he wouldn’t be made aware until he woke up. I wish she could know my husband. I wish she could know our son. Oh yeah, the thing we’d probably be talking about most is the fact that Brandon and I have a little one on the way – well, a 7 year old. Our first child, her first great-grandchild. I’d love to hear how happy that would make her. 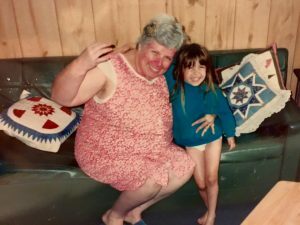 I imagined letting the world of social media know about our adoption in a really exciting way – not necessarily 700 words after I write about my deceased grandma. And maybe we will, and I’ll never post this – we certainly are excited. But this is what my heart began to write in the stillness of the morning at 4 a.m. when I felt that old, familiar pang of loss as I remembered I couldn’t call Nunny. Something I hope we never forget is a part of our story. While it’s going to be an exciting journey to welcome in our son, it’s a journey that begins with loss. We are over the moon that we’ve been chosen to parent this precious child, but no child is supposed to spend 7 years without their forever family. As we are anxiously awaiting the day he is home with us in just a few weeks, we are also beginning to feel the crushing weight of his past and present. We are preparing to sit with him, grieve with him, mourn with him and struggle with him. Probably forever in many ways. Maybe that’s why I couldn’t sleep tonight – so I could remember what it feels like to have a safe person just sit with you. To remember how Nunny sat with me for all those years, and to realize how she is still sitting with me now, as a part of me. And that the part of Nunny that lives in me, will sit with our son. You only learn to sit with someone like that when someone has sat with you. You only learn to sit with someone when someone has sat with you. Nunny had a lot of loss in her life – more than most could imagine. I’m sure she had some people sit with her along the way, but I know it was ultimately much more than a person. She found the Ultimate Sitter, Immanuel, “God with us”. And while Nunny still felt the effects of loss in her life until her last breath, you knew He sat with her. There’s no other way she could have sat so well with her family. We love this little one so much already – literally from the moment we laid eyes on him, we knew he was ours. Maybe that sounds dramatic, but if I can ever have coffee with you and tell you the story of God’s goodness in delivering this little man to us, you’ll know it too. I can’t wait for you all to meet him. Heck, we can’t wait to meet him! But we appreciate your prayers and patience as we both celebrate his arrival into our family and grieve the many losses his young life is holding at the same time. We aren’t asking for pity, just prayers. And maybe to sit with us through this journey if we need it. We’ll be sure to share more details as time permits. I pray you have someone that will sit with you when you need it, too. More-so, I pray you know there is One who is already sitting with you, who waits for you to call – even at 4 a.m.